'We see now that Torah protects and saves,' Rabbi of Paris synagogue says, two days after terrorist sprays bullets at the building. Two days after automatic gunfire was sprayed at the David Ben Ichay synagogue on Paris's 3 Danjon Street, Rabbi Noam Lutzki has spoken about the terrible attack - and called his escape a "real Hannukah miracle." "It was at 9:30 pm or so," the Rabbi stated, to hareidi newspaper Hamevaser. "I was sitting in my office adjacent to the front door of the synagogue, [when] I suddenly heard a loud explosion at the entrance. I waited a few minutes and went outside, we discovered the hole right at the entrance." A large concentration of police forces rushed to the scene, he said. "It is a real miracle of Hannukah, as at the same time there were two Torah classes in the building with dozens of participants," he said. "We have seen that Torah protects and saves." The rabbi said that this incident "just gives us a greater incentive to strengthen our Torah involvement and Torah classes." "The synagogue was built about 15 years ago and is a beacon of Jewish life here," he said. "We were blessed to host Rabbi Ovadiah Yosef tz"l in the synagogue to give over words of Torah during past visits to France." The Jewish Bureau National de Vigilance Contre L’Antisémitisme (BNVCA) contacted Parisian police who launched an investigation, and found a bullet in the targeted window. Security cameras didn't give definitive information as to the identity of the assailants, but two people were seen in the area just minutes before the attack, meaning they could be suspects or witnesses - police are currently searching for the two. Rabbi Noam Perel, the secretary-general of World Bnei Akiva, responded to the attack saying "the shooting at the synagogue and Bnei Akiva compound...won't deter the World Bnei Akiva movement, its delegates and guides from continuing to act to bring Jews from the exile to Israel." "Thank G-d none were wounded from the community, the guides and delegates. We continue to keep the continuous contact with our people, most of whom are on vacation outside the city, despite all the obstacles," continued the rabbi. 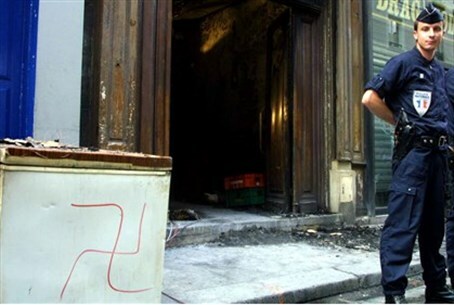 In a statement released by the BNVCA, the group called on the French authorities to spare no efforts to "identify and question the anti-Jewish criminals." It also called for the Jewish communities in France to exert caution given the recent rising spate of anti-Semitic crime. In addition, over the past week, France has seen a number of "car rampages" and massacre-style attacks by jihadists.